President George H.W. Bush died yesterday. He was 94 years old. His death comes less than eight months after his wife Barbara died at age 92. They had been married 73 years. Over the past few years, the 41st President’s health had started to decline. He suffered from several problems ranging from Parkinson’s Disease to bronchitis. Mr. Bush served more than 40 years of public service. He served one term as President, being beaten for re-election by then Arkansas Governor Bill Clinton. He also served as Vice-President for two terms under Ronald Reagan, CIA director, Texas Republican Congressman, and Navy pilot who had been shot down during World War II. His son George W. Bush was elected for two terms as the 43rd President of the United States. 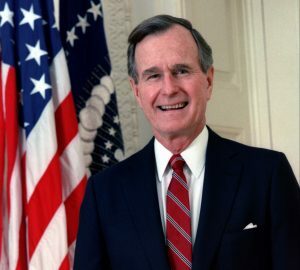 After years of tension between the Bush and Trump families, current President Donald Trump has declared December 5th as a national day of mourning in remembrance of Mr. Bush.